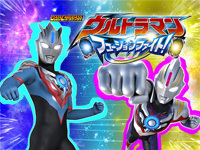 Arcade Belgium - News (en): 2016-07-28 - Ultraman Fusion Fight! Ultraman Fusion Fight! is a new Data Carddass game from Bandai. It uses cards of the same format as the cards that appear in Ultraman Orb, the new TV series that celebrates the 50th anniversary of the Ultra Series. The player can use two Ultra fusion Cards to create a combination as in Ultraman Orb. For example, he can combine an Ultraman Card and an Ultraman Tiga Card to transform into Ultraman Orb Spacium Zeperion. There are also game exclusive cards combinations. Bandai has already announced 56 cards. You can watch the trailer here. MÚSECA 1+1/2 is released today. This is the sequel of Konami's MÚSECA. There are now 2 game modes: pure game and mission. In pure mode, Grafica can be used but they will not cause any effect. In mission mode, Grafica skills will affect the game. Grafica elements work like this: COOL counters PASSION, PASSION counters NATURAL, NATURAL counters COOL and PURE and DARK counter each other. The interfacer is easier to naviagate and charts can now be unlocked directly from the songlist screen during any stage. 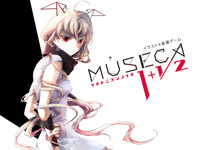 Only scores and unlocked songs from MÚSECA can be transferred to MÚSECA 1+1/2, Grafica are reset. Sega's medal game StarHorse3 fifth chapter will be available tomorrowy. The theme color is renewed from purple of Season IV to yellow. In this new season, the World Derby Tournament features the ultra-long-distance race "WBC LONG" (5000m) which is held in Honolulu. 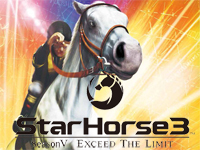 A total of 18 satellites of StarHorse3 Season V - Exceed The Limit can be connected and each one features a 32" LCD touch panel and a reclinging seat for a great comfort. A large update of Synchronica is out today. The cabinet design is totally renewed. New songs and features are added: the rating assess the player's skill progress, the high degree of difficulty "PANDORA" is now playable at any time. "Available for your home in 1995 only on Nintendo Ultra 64 ... Killer Instinct". All players remember this announcement coming out of the Killer Instinct arcade machine released by Midway in 1994. We also remember what happened next; the game would arrive on console in 1995 as expected but... on Super Nintendo and Game Boy, the release of the Ultra 64 (later renamed Nintendo 64) having been pushed back. A soundtrack CD was provided with the Super NES cartridge. 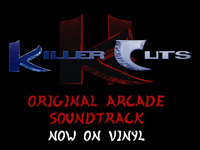 This CD titled Killer Cuts included 16 remixed themes (including one hidden song). Composed by Robin Beanland and Graeme Norgate at Rare, the soundtrack is memorable for anyone who played the game at the time. It's now available on 180g vinyl pressed by the iam8bit label! Remastered for vinyl by Infrasonic Sound studio in Los Angeles, it's announced as something never heard before! Icing on the cake, a loop screaming "c-c-c-combo breaker!" indefinitely is available at the end of side A. There are 3 available covers, each representing one character of the game. You have the choice between Spinal (clear vinyl), Sabrewulf (blue vinyl) and Fulgore (green vinyl). While the cover of the 1995 CD showed a 3D rendered Spinal, real puppets were created by artist Chelsea Bayouth for the new covers (that's why Spinal is different on the new edition). The "Fulgore" version (with a metallic cover) is a limited edition available only during the weekend of EVO 2016, it's... this weekend! Specifically, you must pre-order this record between Friday, July 15th at 9:00am PDT (19:00 CEST) and Sunday, July 17th at 11:59pm PDT (Monday, July 18th at 8:59 CEST). It won't be available anymore after that time, its purchase offers you a chance to win the actual Fulgore puppet in a drawing! A digital version of the soundtrack is offered with every purchase. The Spinal and Sabrewulf editions are $25 each and the Fulgore edition is priced at $28. You can also do an Ultraaaa Coooombo by buying the 3 vinyls at once for $78 (that is, no discount at all). As is almost always the case nowadays, they come as pre-orders; vinyls will be delivered to you in October 2016. The online store is different depending on whether you are Europe or in America. 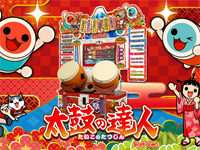 Taiko no Tatsujin: Red Ver. The new update of Taiko no Tatsujin is out today. The new color is red and the visual theme is Mt Fuji. Collaborations start with Macross Î” and crossbeats REV. : The first opening and ending from Macross Î” are featured (Ichidodake no Koinara and Ikenai Borderline by WalküreDont). By playing these songs, players can win live concert tickets, physical goods and in-game Petit-chara and mech outfits. The collaboration with crossbeats REV. starts with the songs Over Clock ~Zenchou~ and Over Clock ~Kaihou~. crossbeats REV. 's character Akatsuki becomes available as Petitchara when the player plays Over Clock ~Kaihou~. Many new songs are already available including anime songs from Crayon Shin-chan, Digimon Adventure, Aikatsu Stars! and Sen to Chihiro no kamikakushi (Spirited Away). The game features Mauchu, a new character designed by Studio Ghibli. 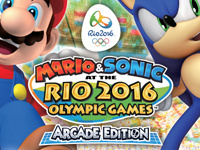 Less than one month before the Olympic Games in Rio, western gamers will finally be able to friendly compete during the games of Mario & Sonic at the Rio 2016 Olympic Games Arcade Edition! We already talked about this game several times. The first time was at the time of the first location test one year ago then on the Japanese release of the game in February 2016. It has now started to be delivered to European and American operators. With any luck, you'll see it near you soon... For those unaware of the game, Mario & Sonic at the Rio 2016 Olympic Games Arcade Edition offers the player the choice to play as one of 20 famous characters from the Mario and Sonic universes with each character having its strengths and weaknesses (power, speed and technical). 9 events are available: 100m, 100m hurdles, long jump, trampoline, 100m freestyle, hammer throw, javelin, archery and rhythmic gymnastics. Two big joysticks with a button and a mat equipped with sensors are used to control your character. Depending on the event, you will for example have to run, jump or make circles with the joysticks as fast as possible to win the first place. Coming in 2 and 4-player setups, Mario & Sonic at the Rio 2016 Olympic Games Arcade Edition is really the ultimate multiplayer game. A great original and colorful game that will appeal to players of all ages! Technically, the game runs on the latest Sega system to date, the Nu1.1 that also runs Luigi Mansion Arcade, CHUNITHM, Kancolle Arcade and crossbeats REV. Here is a video of the game in action shot at EAG International 2016 and a promotional video published by Sega. Sega Joypolis celebrates its 20th anniversary this year with a new attraction: the Zero Latency VR. It's a free-roam multiplayer VR (virtual reality) system created by Sega Live Creation that will open on July 23. 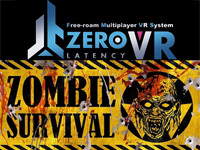 The first game available for Zero Latency VR is a shooting game named Zombie Survival. The action takes place in a town that is attacked by a horde of zombies, the players fight the zombies to protect the rescue base. The game area is 16,8m x 16,8m (282 m²) and the playtimeis 30 minutes (briefing time 15 minutes + play time 15 minutes). 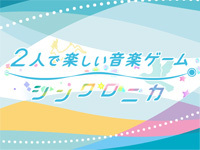 Reservation for the attraction start on July 19, 9:00 on the special site. Up to 6 people can play together. The age limit is 13 year old minimum and the price is 1800Yen. You can watch the Zero Latency VR trailer here and the Zombie Survival trailer here. The famous G-Front arcade game store in Akihabara is moving! Previously on Kuramae-hashi Dori, the shop will now be located in the Chuo Dori main street in a building housing a Lawson convenience store, 100m from the old address. During the move, the G-Front store will be closed from July 19th to 31st for a reopening on August 1st at the new address: Sotokanda 5-1-3. You can get there directly by taking the Ginza subway line and getting off at Suehirocho station. If you come from JR Akihabara subway station, take the main street where there are two Club Sega and Hey. Walk along this street up to the Suehirocho subway station. Instead of turning left to go to the old shop, cross the intersection to go straight towards McDonald's, the new G-Front shop is located above Lawson on your right just after the intersection. 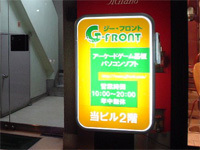 With Mak Japan and Try (whose shop moved four years ago, leaving the famous Try Amusement Tower), G-Front is one of the three main second-hand arcade shops of Akihabara. The fact that the store was emptied over the years by Western retailers and many new Japanese arcade games are released in dematerialized format caused a significant reduction of the sales area (we saw it at the time of our last visit; store size decreased from three floors in 2008 to one in 2015). The new store will be smaller but a bit better located. Although prices of old PCBs have exploded in recent years due to the "retro gaming" madness, there are still many newer titles to be found at great price and you often come across little known gems at low price. There are also posters, joysticks, buttons, cables and other accessories. In any case, you never leave G-Front empty handed. 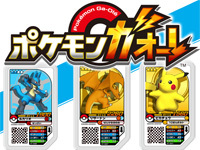 Takara Tomy Arts and Marvelous cooperate to create a children's arcade game named Pokémon Ga-Olé that is out today. It's a card game that uses a special type of cards designed for children named "Olé disk". They are more thicker than normal game cards. Kids introduce them in a card reader and a 1vs1 Pokémon battle starts. 50 Olé disk are already available for the game launch. The game cabinet features a 50" screen. Get Chance! Pokémon Ga-Olé! (Get Chanceï¼ ãƒã‚±ãƒ¢ãƒ³ã‚¬ã‚ªãƒ¼ãƒ¬ï¼) is the theme song of Pokémon Ga-OléHideaki Takatori, Aya Ikeda and ShÅgo Kameda. You can watch the trailer here and a gameplay movie here.